I read a wonderful article recently entitled The Mormonizing of America. It talks about the increase in media attention and the rise to positions of influence and power by members of the LDS faith during the last few generations despite the fact that they are such a small percentage of the global population. I saw this article shared by Mayim Bialik (of Blossom, Beaches, and Big Bang Theory fame) that discusses modesty in Mormon culture and how it effects athletes. Bialik stated in her description of the article “I’m not Mormon, but my in-laws are”. She praises the young lady featured in the article for being well spoken and states that her decisions are “admirable”. On October 10th, the documentary motion picture “Meet the Mormons” was released nationwide in select theaters. The film features 6 diverse members of the church from across the world while “challenging the stereotypes that surround the Mormon faith”. My 18-year-old nephew, who is currently serving as a missionary for the church in Ecuador for TWO YEARS, just wrote our family a letter in which he stated excitedly, “MIRACLES HAPPEN.” What sacrifices he is making as a young man to bring families he has never met to the knowledge of the gospel! It is remarkable to me, as a member of the Mormon church, the strength of our small numbers (less than 2 percent of the World’s population) in reaching the World on a global scale. And the news is almost always positive despite the tendency that we as a nation have to make a mockery of all things good and praiseworthy. Plant Mormonism in any country on earth and pretty much the same results will occur. If successful, it will produce deeply moral individuals who serve a religious vision centered upon achievement in this life. They will aggressively pursue the most advanced education possible, understand their lives in terms of overcoming obstacles, and eagerly serve the surrounding society. The family will be of supernatural importance to them, as will planning and investing for future generations. They will be devoted to community, store and save as a hedge against future hardship, and they will esteem work as a religious calling. They will submit to civil government and hope to take positions within it. They will have advantages in this. Their beliefs and their lives in all-encompassing community will condition them to thrive in administrative systems and hierarchies–a critical key to success in the modern world. Ever oriented to a corporate life and destiny, they will prize belonging and unity over individuality and conflict every time. It’s all true. The Mormon church as a whole achieves success because it is based on deeply moral and selfless principles, with its individuals striving to be more like their Savior in every action. How can you go wrong? This fall we made the decision to enroll the twins in a pretty pricey all-day preschool. Two of the days they are at school I take the “baby” to a wonderful day care and I spend my [suddenly very short] day running errands, cleaning house, making plans, and generally just being productive. Recently I spent this free day at the temple. This is a place I usually go with my husband. We were married here and when we were first married we went at least every month. When we started a family it became a lot more sporadic. It’s important to me for one because, in a worldly sense, its a lot like renewing your vows. When we’re there together I am reminded of why it’s important to protect our relationship and why being organized into families is so special. It is also one of the only places we can go where we force ourselves to sit quietly, distraction and device free. No one gets offended. No one casts judgment. The cares and stress of the world fall away and Heaven is close. This time was a little different because in the times when normally I would look to Aaron’s side of the room, meet his gaze, and smile, or find an opportunity to hold his hand, I realized I was alone. This was the first time I have been to the temple by myself. I sat in the temple for two hours and something hit me very hard. Heaven would be a very lonely place without the ones you love there beside you. As I reflected on my experience that day, I realized that with all the positive sharing of religious views and experiences it should be easy for me to consistently be a shining light to the world of how the Gospel can change your life. Instead I am terrified of how sharing the deepest parts of my faith could change my relationships with the people I care about most. I’ve had enough religious discussions that ended (or started) with “Let’s not turn this into a religious discussion” to know my boundaries. What are people afraid to hear? Is it that they’re afraid that it is true? What would that mean for them? But there is proof in all things pointing to the existence of a Heavenly Father and His love for us. He has His hand in the moving forward of His work on the Earth. At some point every single soul will have an opportunity to hear His truth and accept it or deny it. The choice I have to make is whether or not I, as all those I mentioned before, want to be involved in sharing that I know this. I choose to be involved. So if you’re ready, listen. The Church of Jesus Christ of Latter Day Saints is the true church on the Earth today because within its teachings is the fullness of the Gospel, even if there is truth in all religion. Our Heavenly Father has a perfect plan, one that we usually do not fully understand, and if we follow it and trust in it we will be able to live with him and with our families again when our mortal life ends. Part of this plan was choosing his son Jesus Christ to atone for us as imperfect beings. Another important part of his plans was restoring his true gospel to the Earth in this dispensation through a young and humble disciple of Christ, Joseph Smith. Joseph’s courageous example to follow the Gospel even through trials and persecution is second only to the Savior’s. I know that if I keep the covenants that I made when I was baptized and when I entered the temple, and that if I keep the commandments that were set for us many generations ago, that I will be able to more clearly see the path that God has set for me. And the truth is, even if it weren’t true, there is no better way to choose to live our one and only chance at life. But the Church of Jesus Christ of Latter Day Saints is true and I am eternally grateful to be a part of spreading this news. 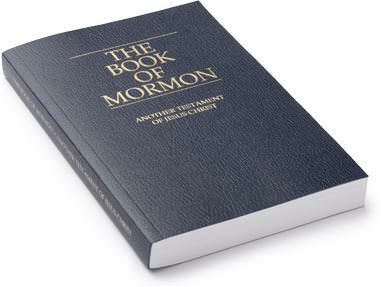 Click here to request a free copy of The Book of Mormon: Another Testament of Jesus Christ. I think this post was incredibly well written and parts of it simply touched me to the core. I love you so much Whitney! Good job on this one, and what a way to be brave! I feel the same way. No one will listen to me either.